The Cherry G81 does not look special. I did not select it, I just bought it together with one of my early computers. 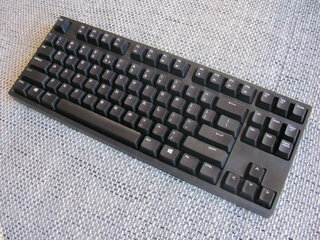 It is a regular 105-key PC German QWERTZ keyboard as used in Austria and Germany. (The 104/105-key layout is like the 101-key keyboard including some special keys to activate common Windows functions.) I bought it in 2000 and it worked well. Two years later - when I killed it by pouring a glass of water into it - I bought another one. It is connected via PS2 plug, which gets rare these days. Switches: It was cheap and I always believed it to contain rubber domes. But even after buying my first mechanical keyboard I went back to using it. I was used to it and liked the typing experience. Recently I found out why. During cleaning I recognised the typical Cherry MX mounts - could my old Cherry keyboard be a mechanical one after all? The Cherry G81 contains the Cherry MY switch, a semi-mechanical keyboard switch, with a spring in each switch. It is considered something between rubber dome and MX with a life expectancy of 50 million presses, which is the same as of modern MX. Typing: The Cherry MY have no tactile feedback and actuation happens two third on the way down. The counter force of the spring increases linearly while pressing it, with a peak force of 120 cN. In a way they feel like linear MX switches. (Some people say MY feels like MX-Black but harder. I do not own any MX-Black, but the keys are definitely harder to press than any MX I know, even MX-Clear. The comparison of MX switches states that MX-Black has an actuation of 60 cN, much less than the MY.) There is no click sound, only some slight noise from the key caps. This is the most muted keyboard I know. When I press slowly then there is absolutely no sound at all. None of my other keyboards are that quiet. The Cherry G81 is heavy because it has a steel plate, like high quality keyboards nowadays. This might explain why I stayed with it for such a long time without looking somewhere else. For the small price of 29 Euro (price in 2002), it is definitely the best keyboard I own. Das Keyboard Model S is a "high-quality mechanical keyboard." I was new to mechanical keyboards - thanks to peer-geek Michael Clay for telling me about them - and had no idea about switches. The Model S was the first high quality mechanical keyboard that I liked which I found on the German market. It was supposed to be cool so I bought it. I even went for the ultimate version with blank key caps, because I wanted to master touch typing. Switches and typing: The Model S contains gold-plated, mechanical, Cherry MX-Blue switches. They offer the classic mechanical typing experience: There is a tactile feedback halfway down as the key actuates. The noticeable bump lets you know that your key press has been registered. And it is noisy. Really, the MX-Blue clicks noticeably, and can be disruptive in close working conditions. It makes so much noise that it breaks my own thoughts when I type fast, especially as I am used to the super quiet Cherry G81. Due to this noise I am not using it on a daily basis. Maybe I should by it again with other switches. The Model S comes with an USB hub included, which is very handy to connect a mouse or other devices, especially when working with a different computer almost every day. I love the look of its blank surface. The packaging includes a tiny cloth to wipe it and keep it shiny black. Its blankness makes it perfect to show off your mastery of the keyboard to your peers. Most colleagues are confused (and unable to use it) or amazed. It is definitely useful to improve typing accuracy, and it has improved mine. Since my Pair Programming Tour and working as freelance Code Cop, I am almost exclusively programming in a pair. When I visit someone to pair with, I bring my own keyboard. I have to carry it, which makes me wish for a small one. I do not like compact or laptop keyboards, because I am really used to regular QWERTZ layout. The answer is TKL - "Tenkeyless". 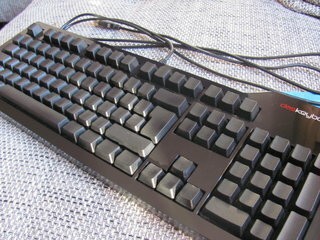 As the name suggests, tenkeyless keyboards are standard full-sized keyboards without a tenkey / number pad on the right side. 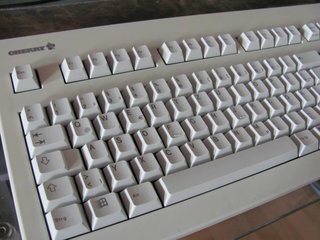 The number pad contains not ten but 17 keys, making the TKL an 88-key PC German QWERTZ keyboard (if such a thing exists). As the TKL is a standard keyboard I am able to type as usual. The only slight problem is that I am unable to press Ctrl Numpad / which toggles line comments in IntelliJ IDEA. 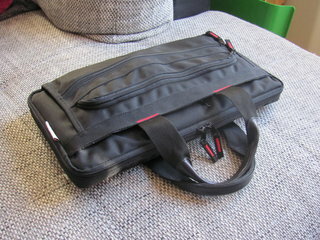 I own a bag for the TKL, courtesy of Michael Clay. When he heard about my planned Code Cop Tour he showed up with four different TKL keyboards so I could chose one. I bow to the master of keyboards. I needed a TKL to put into my backpack. While I could have created one by myself, I bought a Filco Majestouch-2. Switches and typing: This time I avoided Blue switches and bought the Majestouch with Cherry MX-Brown ones. The Brown switches are one of the most widespread switches today. They are tactile, non-clicky and relatively soft with an actuation force of 45 cN. They are supposed to be silent, still there is some sound from the key caps themselves. When I type fast the plastic key caps make a high pitch noise. Of course the sound is not as nasty as from the Model S, but it is quite noisy for my liking. Fortunately its noise is not a problem during pair programming because there are no extended periods of silent, fast paced typing. The Filco Majestouch-2 is a basic keyboard, exactly what I need. Maybe it is a bit of an understatement because it looks so very basic. The TKL version is ideal for travelling. I always carry it with me when I am going to pair with an Austrian or German developer during work or Coding Dojo. With the Majestouch I mistype more often. I guess this is because the mechanical switches actuate half way down, while the MY switches register the key around two third of the way. I am just too used to my old Cherry G81. During my pair programming activities I often work under UK or US layout. I am able to operate the English layout sufficiently well if I see the right labels on the keys. So one TKL is not enough. I took the NovaTouch with (87-key PC) US English QWERTY keyboard layout. It is "exceptionally quiet and suitable for heavy-duty typing or gaming." Switches: The NovaTouch contains Topre switches with MX compatible key caps which is great if you love custom keys. The Topre switches are semi-mechanical, hybrid capacitive switches "that combine the benefits of a mechanical spring-based switch and an electrostatic capacitive sensor to provide excellent tactility, comfort, and durability. The unique design of these Hybrid Capacitive switches require no physical mechanical coupling, therefore eliminating key switch bounce and chatter for a frictionless experience." Typing: The Topre switch is similar to the Cherry MX-Brown, a tactile, non-clicky switch. There is the bump halfway down. Compared to the Majestouch-2 the force needed to press the key is slightly higher and the bump seems "bigger" and more articulated. (Actuation is at least as strong as for MX-Clear as used in the CODE keyboard described below.) While the marketing description above describes the keyboard as exceptionally quiet, unfortunately it is not. Like the Majestouch-2, its plastic key caps create some noise when pressed. 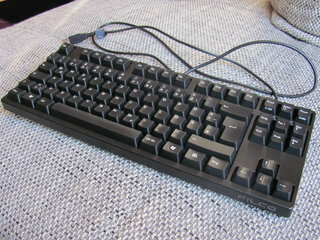 The NovaTouch ships with a set of o-rings which made it more quiet, but some sound remains, especially when typing fast. At least the noise of the key caps is more low pitched than of the Majestouch-2. The NovaTouch is a bit bloated because it has some audio and repeat rate adjustment function keys, which I never use. Even worse, the function (Fn) key replaces the menu/right click key. I do use the menu key because I love keyboard navigation and I rely on it to activate functions from context menus that do not have their own keyboard shortcut. The NovaTouch is despite the missing menu key a very nice keyboard. Its cable is braided and can be removed from the keyboard. It comes with o-rings and and a wire key cap puller to remove the key caps. But the best thing is its box. While all other keyboards ship in a simple cardboard box, the NovaTouch lies in a large, shiny black box, softly bedded on rubber foam. It looks like decoration inside its jewel case. It is marvellous. I use the NovaTouch when I pair program with someone who uses UK or US layout. I bring it to international Coding Dojos or workshops. It is small enough to fit into my hand luggage when flying. During my Pair Programming Tour I even carried both, the DE and US layout because I never knew which layout my next pairing partner would use. Despite all these keyboards I was still looking for a keyboard to use every day - as a replacement of my trustworthy Cherry. I did not really need it, but somehow wanted it - the perfect opportunity for a present. 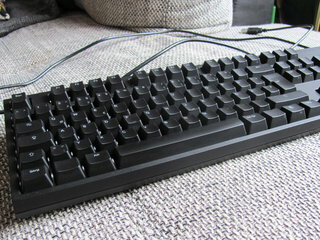 For Xmas I ordered a WASD CODE V2B, with 105-key PC German QWERTZ layout. It is a "simple, clean and beautiful mechanical keyboard, a collaboration between WASD Keyboards and Jeff 'Coding Horror' Atwood." Switches and typing: I selected the CODE because of its switches. The MX-Clear are stiffer than the Brown ones, with a tactile bump and weighting of 65 cN. The harder actuation force is good for me, being used to the Cherry-MY keys, which are still harder to press. The tactile bump feels right. Again the plastic key caps make some noise and the keyboard is louder than the NovaTouch. Like the Majestouch-2 the CODE is a very basic keyboard, without any label, its black matte surface looks sharp. Like the NovaTouch its cable can be removed and a key cap puller is included. Most important has a series of dip switches which enable the function key, caps lock and different layouts. This is most useful, because I can have my menu key instead of the function key. It also has LED back lighting, which probably is the reason for it to be more expensive than my other keyboards. (The CODE is around 200 Euro where my other keyboards are between 100 and 160 Euro.) There is a slight glitch: when my computer wakes up from power-saving/standby mode, sometimes the keyboard is not activated and I need to disconnect and reconnect the USB cable to activate it, which is annoying. After a few months I got used to the CODE and despite the glitch it is my favourite German keyboard. I enabled LED back lighting and found it quite comfortable because I am working a lot in the evenings. It is difficult to predict the future. At the moment I like my CODE and it looks like I finally found a keyboard to keep. On the other hand I have not tried all Cherry switches, e.g. MX-Black. Maybe I should get a Cherry MX Switch Pro Sampler to compare them. The sampler looks like a great desk toy to impress and confuse colleagues. At the moment MX-Clear is the stiffest switch available from Cherry, so I might need to look for alternatives. I am curious about the Buckling Spring as used in the original IBM's Model M. People say that this is the best keyboard ever made. I will have to try it one day.